A boil water advisory is in effect at Okanagan Lake park (North and South campgrounds), until further notice. Boil water before using it for drinking, making ice, cooking, washing food, or brushing teeth. Use a hand sanitizer after washing hands. use an alternate, safe source of water. A slump in the silt bluff between the campgrounds at Okanagan Lake Park have closed the recreation trails between them. It is likely that the trails will remain closed at minimum for the remainder of 2018. Beautiful, sandy/pebbly beaches surrounded by ponderosa pine and sagebrush make this park the perfect spot for swimming and water activities. At the two large campgrounds in the park, panoramic views will add to your enjoyment. 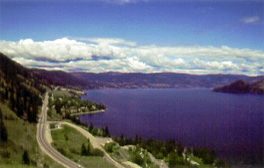 The landscape across the lake, from beach to skyline, is part of Okanagan Mountain Provincial Park, accessible by boat or by driving back through Kelowna. For your convenience, during the summer season this park has a concession located at the south campground gatehouse and managed by the Park Operator. Rattlesnakes – The dry grassy hillsides above the campgrounds provide habitat for a variety of snakes, including rattlesnakes. This is no reason to avoid the area, just remember to wear heavy pants and high boots and avoid putting hands and feet into crevices that you can’t see into. People who encounter rattlesnakes along trails should detour around them and go on their way. Rattlesnakes will not chase after people and cannot strike beyond the length of their body. Guests with reservations: Upon arrival at the park, register at the gatehouse and then proceed to the campsite. Guests without reservations: Upon arrival at the park, check in at the gatehouse for sites that may be available on a first-come, first-served basis or for “One Night Only”. Guests may be required to add their names to a waitlist during peak season. Guests with reservations: Upon arrival at the park, check the reservation board for campsite number and then proceed to the site. Group Camp/Picnic Reservations:	No group campsite or group picnic site reservations are accepted at this park. Located 11 km north of Summerland on Hwy 97. History: Created in 1955, this park shows what effective park planning can achieve. In the late fifties, thousands of non-native trees were planted on a barren hillside between the highway and the lake. Today, this area is a natural arboretum and the extensive tree cover is home to various bird types. Conservation: Though the campground areas are dotted with irrigated lawn and non-native trees, the park still falls into two basic zones with bunchgrass found in exposed areas at low elevations and stands of Ponderosa pine and Douglas fir found in the upper sections. Many wildflowers can be seen along the nature trail away from the more developed areas of the park. Of special note are the Chocolate lily and the Columbian lily. Wildlife: The close proximity of the highway and the fencing on the uphill side prevent movement of large mammals such as deer into the campground. Though sightings of large mammals may be infrequent, the park still has a variety of wildlife to see. Harmless gopher snakes and colonies of Columbian ground squirrels can be seen along upland hiking trails. Bats are quite common in areas bordering lakes and may be seen from the park, though they generally prefer areas with less human presence. The Western toad and Western painted turtle have been spotted in the park which also provides habitat for a variety of birds such as Cedar waxwings, quail, Northern shafted flickers, Western meadowlarks, hummingbirds and a blue listed bird species, the Lewis’s woodpecker. Insect life is extremely diverse in the park with the Ant Lion being, perhaps, the most interesting. They live buried in conical shaped traps in the sand in ambush for other insects. Canoeing and kayaking are allowed on Okanagan Lake. Various freshwater fish are available in Okanagan Lake. Anyone fishing or angling in British Columbia must have an appropriate licence. For information about freshwater fishing, including regulations, restrictions and limits, please check the Freshwater Fishing Regulations Synopsis. There is a 1 km trail that runs along the lake, connecting the two campgrounds. There are self-guided interpretive signs along this trail and another short trail that leads uphill toward the highway and ends at the viewpoint parking lot on the way to the south campground. For your own safety and the preservation of the park, obey posted signs and keep to designated trails. Shortcutting trails destroys plant life and soil structure. There are no lifeguards on duty at provincial parks. There are swim areas for each park marked with swim buoys. The beach is pebbly and not sandy. Okanagan Lake is popular for a wide variety of water sports including waterskiing, windsurfing, boating, fishing and swimming. This park offers excellent birdwatching opportunities. There is a double concrete boat launch available at south campground. There are no docks or no tie ups; however, houseboats can moor there and are welcome for overnight visits. The site is marked and you will need to pay a camping fee. Not recommended to anchor in front of the park due to strong winds. There is a concrete area where you can walk out to get in the boat, narrow, and not accessible for wheelchairs. There is a paved L-shape turnaround area by the ramp and 12 parking spots. This park has a day-use area along the lakeshore, with picnic tables and fire pits. The north campground has pit toilets located on the campsite terraces and flush toilets in the shower building. The south campground has a pit toilet at the boat launch and one beside the shower building and flush toilets inside the shower building. There is a playground area available at the south campground in this park. The shower building at the North Campground is found roughly 100m uphill from the beach area beside site 80. Both the men’s and women’s sides have two sinks with plug-in above, one toilet and two shower stalls. The new shower building at the South Campground is situated in the center of the park beside the playground. The women's washroom consists of three showers with change stalls, three sinks with plug-ins and mirrors, and two toilets. The men's washroom consists of three showers with change stalls, three sinks with a plug-ins, one toilet, and one urinal. This washroom is also wheelchair accessible with its own stall designed for persons with disabilities and/or families with young children. This spacious washroom consists of a shower, sink with a plug-in above, toilet, and hand-rails. Each washroom also has soap dispensers and hands free dryers. In addition, the exterior of the building is paved around it for easy access and there are four sinks located outside at back for dishwashing. This park offers vehicle accessible campsites in two campgrounds: North Campground and South Campground. Campsite reservations are accepted and first-come, first-served sites are also available. The North Campground has 80 sites, including nine double sites, all of the 80 sites are reservable. The campground gate is closed in the off-season. There is an information shelter listing site availability and a phone down the hill towards the beach. Please follow directional arrows painted onto the pavement as some roads are one-way to provide the best access to the sites. This campground is laid out in a series of three terraces overlooking Okanagan Lake. The sites are large and well spaced with lawn and trees in between for improved privacy. The sites are located only on the lake side of the roads which increases privacy and allows for better views of the lake. The campsite pads are gravel and have fire rings and picnic tables. Wide, well packed trails lead to pit toilets and in between the terraces. The South Campground has 96 sites, 94 of which are reservable, the remaining two are available on a first-come, first-served basis. There is a gatehouse at the entrance to the campground where guests must register. The gate is open until snowfall with winter rates in effect though no services are provided. This is a very different campground than the north campground. All of the sites are at lake level and very close together though there is variation in site layout. Some sites are long, narrow gravel and back onto the hillside. These sites are close together but still separated by trees and shrubs. Other sites are long, narrow and paved with the picnic table and fire ring located behind the site down three or four concrete stairs to a treed lawn area. A third style is short but wide gravel where a tow vehicle must be parked beside the trailer. These sites are not suitable for motorhomes or long trailers. These sites are separated only by cement parking barriers and are similar to double sites. The beauty of this campground is the easy beach access from all sites and the large treed lawn areas shared by some of the sites. There is a phone by the shower building. The closest store is the Little Acres Fruit Stand 500m south of the park entrance on Hwy 97. For more services, visit Summerland 11km to the south or Peachland to the north. There are eight reservable walk-in campsites in the south campground. The South Campground shower building is wheelchair accessible. The North Campground has fairly steep roads due to the topography of the landscape, which may make is less suitable for wheelchairs than the south campground. The South Campground has sites for winter camping.